Scientists monitoring the vibrations of natural rock arches have found that the resonant frequencies of arches undergo dynamic changes from day to day, according to research presented at the 2018 SSA Annual Meeting. University of Utah doctoral student Paul Geimer and colleagues are analyzing these frequency changes to determine whether they can be used to predict when a natural bridge might be ready to collapse. Natural rock arches, such as Rainbow Bridge, one of the world's largest, or the thousands that dot the desert of southern Utah, vibrate as wind, earthquakes and human disturbances shake them in minute ways. 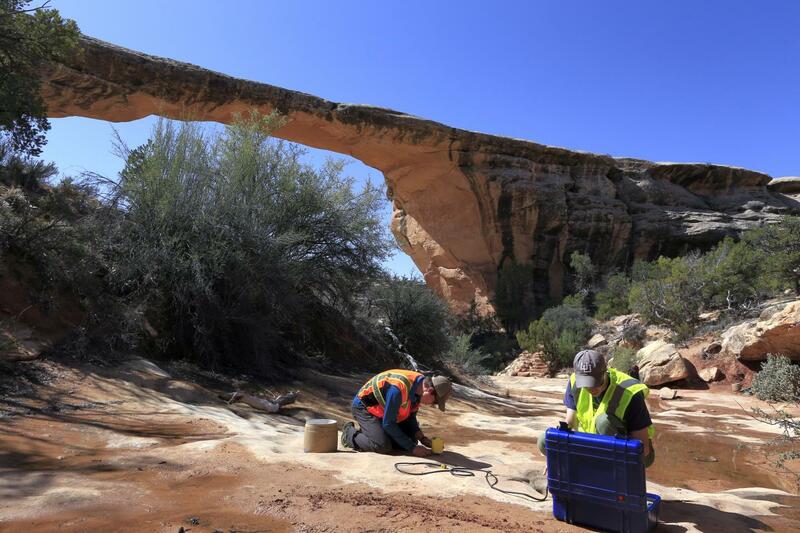 "One of the main drivers of the research was the collapse of Wall Arch in 2008 in Arches National Park [in Utah], right along the trail," said Geimer. "It happened in the middle of a calm night in summer with no indication that anything was about to happen." Geimer's advisor University of Utah geoscientist Jeff Moore had also received a request from the National Park Service and Native American tribes worried about the future of Rainbow Bridge, where tourism helicopters fly over nearby Lake Powell. "They wanted to see if we could tell them more about the potential dangers from helicopters, and about the vibration levels that the bridge might be experiencing from these manmade sources," Geimer said. "Vibration monitoring of man-made structures to detect and measure damage is a well-established technique within civil engineering, and now we're able to apply many of the same methods to natural structures where we don't have the same level of prior knowledge about the stability of the structure or material properties," he noted. One focus of Geimer's work has been Aqueduct Arch in Utah, where the researchers have collected a year's worth of continuous data on the bridge's vibration frequencies, detected by broadband seismic stations placed near the arch. The unusually long record allows the scientists to correlate frequency changes with changes in the environment and make predictive models for how environmental conditions alter the stresses within the rock. "I have been surprised by the dynamic nature of the arch and how much frequencies shift," Geimer said. "The elastic daily and annual changes have been really dramatic." While these changes are likely acting to weaken the arch over time, the researchers haven't yet been able to identify a frequency change that would indicate an imminent collapse of an arch. "We don't believe that we have measured a site with significant enough changes to indicate failure–all variations measured to this point have been caused by temporary, recoverable changes to the rock," said Geimer. Not every arch is as dynamic as Aqueduct, he noted. "We've measured more than a dozen arches, and an outstanding question that we are still working to answer is why elastic frequency changes aren't common across all arches and what a lack of change means for long-term stability."